This is a fun little quiz. I thought I'd ace it but I missed one. How well did you do? What Makes A Great Fishing Club? In many of my posts I mention the club The Triangle Fly Fishers. I am heavily involved in this club and I have been on the board for a few years.We have board meetings once a month and a lot of time is spent discussing what we can do to make our club better. Let me describe what are club is first because really it is more than just a club. If you are a Trout Unlimited member in the NC-Triad you are a Triangle Fly Fishers member by default. The club represents the Trout Unlimited Chapter for the area. One interesting thing is our club also represents the Federation Of Fly Fishers in our area. The thing I really like about our club is there is no requirement to be a TU or FFF member to be a member of the Triangle Fly Fishers. The club is a fly fishing club first and foremost and we never wanted to lose site of that or be leveraged by an outside entity. The clubs focus is always changing but some constant things are always there. There is not very much information on fly fishing in our area. The club is pretty much the only resource in the area. When people think of fly fishing they usually think of trout. When they see members of our club holding largemouth bass, carp, striped bass and red drum it really peaks curiosity. The beauty of the club is not only can people talk to people who have fished for these species but they can learn techniques and find out information to fish on their own. The club tries to have a few scheduled group trips ever year. There are monthly meetings that have a guest speaker giving a presentation. Guides and professional fly tiers are brought in to give talks. There is always an emphasis on conservation and the club makes considerable donations to conservation projects. Recently we are adopting and coordinating a restoration project of a local stream. There is also a couple stream clean ups that go on through out the year. The club knows kids are the future of fly fishing. N.C.T.U. runs a camp called Rivercourse. The camp is basically a fly fishing nirvana for kids between 13-15. They go to camp for the week and learn about fly fishing, tying and conservation. The camp costs $700 and each year the Triangle Fly Fishers sponsor two kids. Usually the choice is made by an essay contest asking children to write us on why they'd like to go to the camp. Many club members want to use their passion as a way to give back to society. I can't think of a better way than Project Healing Waters. This is an amazing program that uses fly fishing to help rehabilitate war veterans back into society. The program goes over fly tying and local fly fishing trips. Another great program members are involved with is Casting for Recovery. Breast Cancer is such a common thing now days almost everyone knows someone who has been effected by it. Casting for Recovery offers fly fishing retreats for breast cancer survivors. Fundraising is always a big thing for clubs. I've always been amazed at the fact that the Triange Fly Fishers can run and fund projects by only holding one fund raising event a year. Donations are made through out the year to TFF by vendors and other people in the industry. No one wants to be bombarded by requests to send money. The club hosts an annual Pig Pickin'. At this event guided trips and fly fishing related prizes are raffled and auctioned off. These events really reflect the support for the club. The club provides a place for people to find fishing buddies and other people who are suffering from the same addiction. Chasing anything that will bite. With the new year I started to think about what makes a club great. There is always the struggle of making everyone happy but in the end the goal is to have fun. You can have all the cool programs you want but really it's the people that make a club great. The Triangle Fly Fishers are lucky to have so many people that care about having this resource in the area. I have made more friends through this club than any other group I have been a member of. I look forward to our presence at the Raleigh Fly Fishing show and I expect we'll have probably one of the best years yet. I have been fishig recently but I haven't done well at the catching part. My buddy with a boat was nice enough to have me tag along to hunt for striped bass. 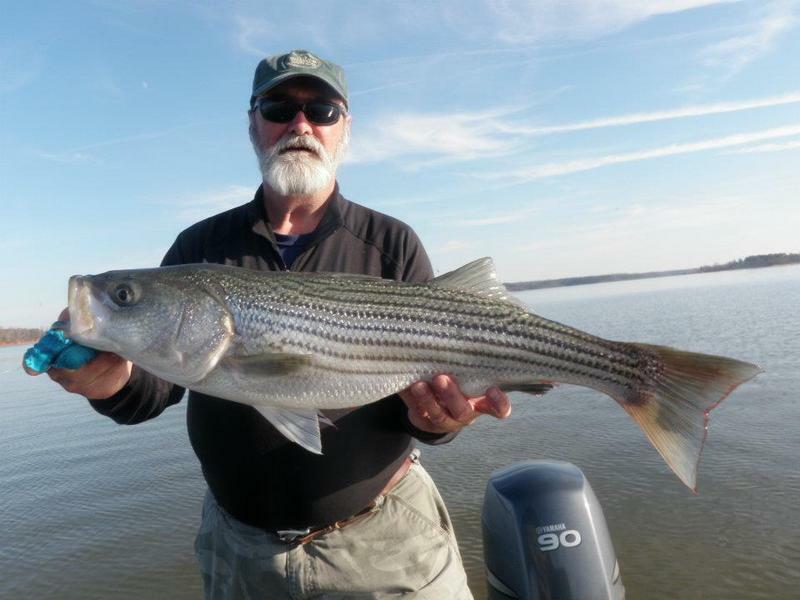 Kerr Lake is notorious for striped bass fishing. A member of the Triangle Fly Fishers talks about how great the fishing is and teases us with pictures like this. Striper fishing is a whole different monster from other types of fly fishing. The rods are 8wt or heavier. Sinking line is a must. The fish can range from busting shad on the surface to chasing bait balls 40ft deep. The technique is to find birds hovering in a certain area. Hopefully this is a sign of feeding stripers pushing bait to the surface. 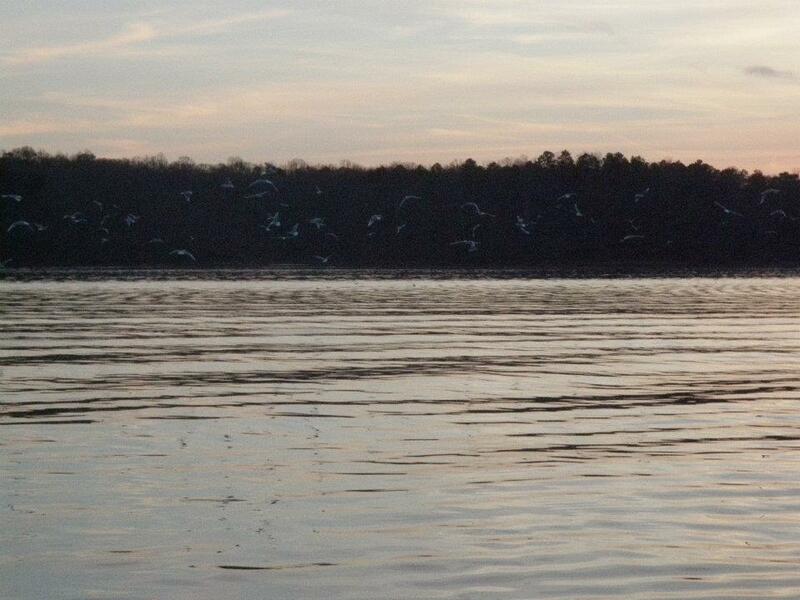 The first time I went out we traveled miles across the lake before we found birds. We marked fish at depths between 40-60ft. Neither one of us had sinking line that could fish the water properly. The second time I had bought some sinking line for Christmas and this last weekend I felt well equiped. 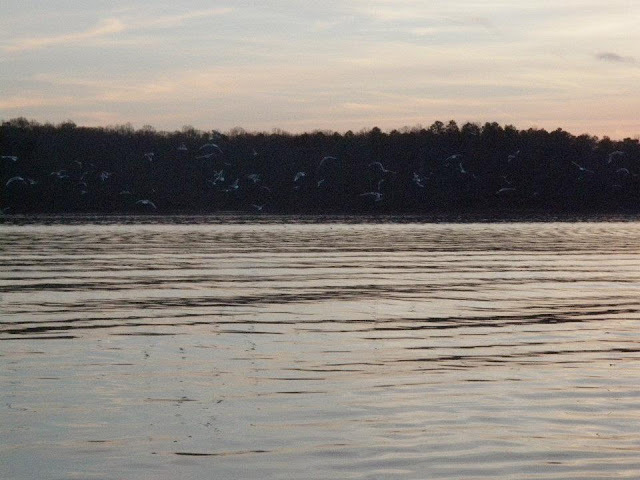 We launched from a different side of the lake and this time we saw birds quickly. We frantically fished the water and within 20min a stiff breeze picked up. A cold front was coming in fast. The birds stopped working the water and just sat. What was once a fast and busy atmosphere was now dead and silent. The only sound was of fisherman complaining about the wind chill. It didn't take long for us to decide to call it a day. I think if we had a little bit more time when the birds were working we might have gotten lucky. There is a chance we'll go again around Martin Luther King day. If that doesn't happen I will probably only fish lakes close to home. That's at least until pickerel season.